Mort Künstler’s illustration for Saga, November 1954. Mort Künstler is best known nowadays, at 79 years of age, as a historical artist, his work focusing primarily on scenes from the U.S. Civil War. However, as the Florida writer who signs himself “Subtropic Bob” observes on the Web site Men’s Pulp Mags, Künstler was once “one of the greatest of the many great artists who provided cover paintings and interior illustrations for men’s adventure magazines in the 1950s, 1960s, and early 1970s.” To confirm that point, Bob has collected on his site a number of the paintings Künstler did for slicks such as For Men Only, Stag, Saga, and Male. Künstler appeared to specialize back then in painting menacing Nazis, desperate and dangerous beasts, World War II commandos and Cold War spies, and curvaceous young women in nasty danger and the most negligible dress. Judging by the female figures in his fine art, there seems no question that Künstler spent many (no doubt pleasurable) hours observing the distaff division of the human species. Although the artist created covers for a few crime-related novels, such as the 1959 Pyramid paperback edition of Court-martial, by Jack Ehrlich (right), and his paintings were featured on a series of Nick Carter paperbacks in the 1970s, most of his book-front work was done for western and historical novels. That’s too bad, because he had a talent for painting women that would’ve wowed the mid-20th-century browsers already expecting to find suggestively illustrated jackets in the mystery section of bookstores. Click here to read Subtropic Bob’s fine piece, which includes an assortment of links to Künstler’s work available on the Web. Given Bob’s interest in the aging artist, I hope he will someday arrange to interview Künstler about both his past and his portfolio. 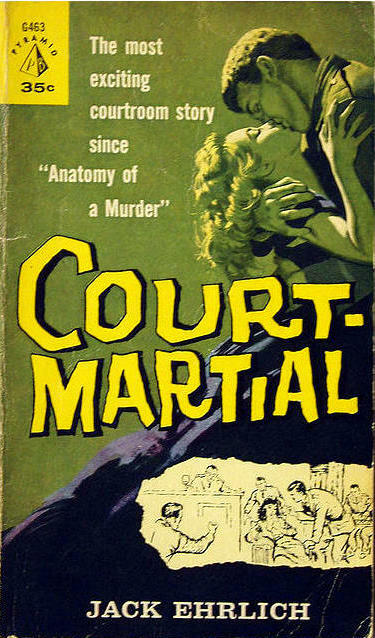 I love that cover for Court-Martial. My next book HAS to have a gorgeous hand-drawn font for the title. It has so much character. Kunstler also drew a lot of pencil-art covers for Max Brand dust jackets published for Dodd, Mead's hardcovers of that author's westerns. Worth looking for.